I naturally have a wave to my hair. With it being thick and healthy this can make it look unkempt. It isn't a wavy, curly look that some people try to get, nope it is just a wild and crazy look. If I want to smooth it out I really have to utilize hair straightening products and tools. TONI & GUY's new straightener (TGST2811N1) creates dramatic results, thanks to its 1” curved Tourmaline ceramic plates, which allow for maximum styling flexibility. The two floating plates clamp together perfectly with no gaps, and reach professional heat levels of up to 410°F, with a rheostat dial that enables multiple heat settings. As with the new curling irons, the straightener also features instant heat recovery and a fast 30 second heat-up. A 9-foot tangle-free swivel cord allows the user plenty of room to work. The 1 inch iron makes it easier to do smaller portions of my hair, preventing the lines that I can get from straightening. It makes it feel more manageable to have a small iron like this, still long in length but thinner in width. I love how the heat can be managed with a spin dial. My hair does not need an intense amount of heat to straighten so I can choose a lower heat level than the professional 410 degrees. One of the best perks was the 9 foot cord! I can see this being a huge plus for hair dressers as they have to rotate and maneuver around their clients chairs. It was perfect for me as well, to plug it in to the wall behind me. The swivel allowed me to easily straighten around my head without having to move to another place on the floor. Check out the difference. The left photos are before using the TONI & GUY straightener. 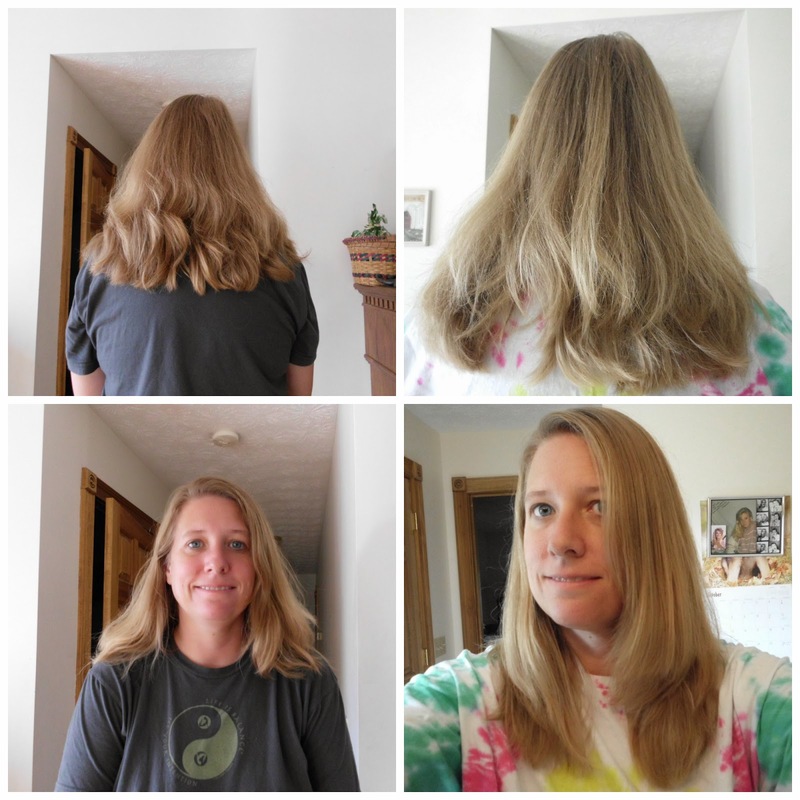 The photos on the right are just after a few minutes of straightening. So much better and it didn't take long at all! I didn't even put any product in my hair before or after, and the straightener worked wonderfully! Be sure to look for TONI & GUY products at Target stores. I should try my girls' flat iron. My hair is wavy all around, and curly around my face. When it gets combed out, it just looks messy as you say. That iron really made your hair look so nice.